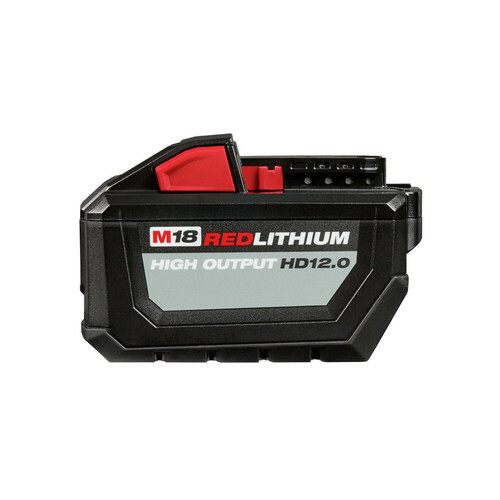 The M18 REDLITHIUM HIGH OUTPUT HD12.0 Battery Pack provides 50ore power and runs 50ooler vs M18 REDLITHIUM HD battery packs. The massive increase in power elevates the performance of the entire M18 system and drives the next breakthrough in M18 FUEL, generating the power of 15A corded product. It delivers fade free power and runs substantially cooler through heavy applications, allowing tradesmen to push their cordless tools harder and longer than ever before.The M18 REDLITHIUM HIGH OUTPUT HD12.0 is the best performing cold weather pack ever made, providing increased power in extreme cold weather conditions (below 0 degrees F / -18 degrees C). It provides the most work per charge of any professional power tool battery in the industry, driving full corded replacement on the jobsite. The REDLITHIUM HIGH OUTPUT HO12.0 battery is fully compatible with 150 M18 solutions. Have used it in two cordless Hole Hawgs. Both burned up under normal conditions. Don’t know if its the battery or the tool. Any thoughts? This battery is a beast ! It lasts forever it seems. I have at least one of each type saw, that Milwaukee makes in the 18V Fuel series. I use the new 12.0 in them all, and cut out the mid day battery swap. Not to mention it’s really a must have for the table and miter saw. One cane with a 9.0 which was ok ..12.0 is better. These 12.0 High output batteries make your tools run longer. That’s obvious. They also make your tools more powerful under heavy loads. Bigger hammer drills and saws definitely run better than the competitors on these packs. I have 7 and want more. Use it at work with fuel 5" grinder. Works perfectly. Thinking about buying 7"/9" to see how it does but my guess is it will be great. I use Milwaukee tools daily, with the majority being the M18 Line. The M18 HD12.0 Battery was a welcome addition to my arsenal, and it definitely has the power I was looking for. I was on a job recently where a homeowner was concerned about a dead tree on their property, and although I didn't have the chainsaw with me, I used my M18 Sawzall with the HD12.0 Battery. I was worried that my Sawzall was going to overheat because it's not the Fuel version, but it actually ran great while I cut the tree down, and trimmed it into smaller pieces. Overall, this took about an hour and a half, constantly cutting the tree in different places(It would have gone much faster if I had my rough tree trim blade on. Out of my M18 5.0's & HO9.0, I'm massively impressed with the HD12.0. Some tools do take more of a toll on the battery life than others, but that's what the speed charger is for. If you don't have one, it will change your battery charging life. I would highly recommend this battery. GET IT! By the way, when I finished cutting the tree down the HD12.0 Still had 2 bars on the battery! One of the bateries made a squealingtype noise on its first charge. I hope that it is nothing. Time will tell. How long does this carge last? BEST ANSWER: No matter the task or the tool, I get nearly twice the run time out of these than I get with the 9.0 batteries. Wasn't expecting that, but it's been my experience so far. A significant power increase for the tools too, even over the 9.0 batteries. Is it compatible with my Milwaukee circular saw and surge impact driver? BEST ANSWER: If they are part of the m18 platform, then yes. I suspect they are. Thanks, they are very large and I worry they won’t fit all the tools. This battery 48-11-1812 is compatible with the M18 platform. What is the weight of the battery compared to the 9ah? BEST ANSWER: The weight of the battery model 48-11-1812 is 3.70 lbs. Will it charge on any charger? BEST ANSWER: We recommend the Milwaukee 48-59-1808 M12/M18 Lithium-Ion Battery Rapid Charger.